Researchers at Rice University have taken a deep look into atom-thick catalysts that create hydrogen to pinpoint precisely where it is coming from. Their findings could speed-up the development of 2D materials for energy applications, such as fuel cells. 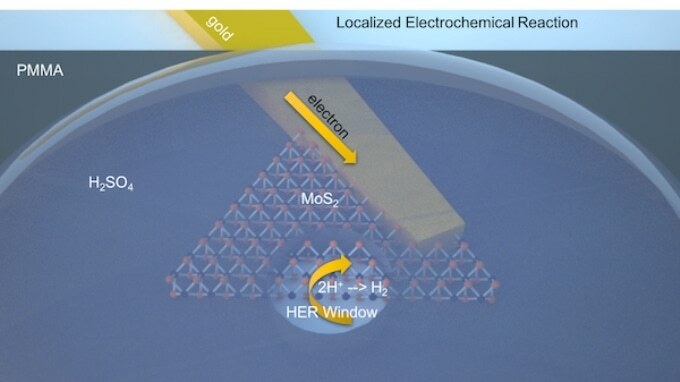 The Rice lab of Materials Scientist Jun Lou, with colleagues at Los Alamos National Laboratory, developed a method to probe through miniscule “windows” created by an electron beam and measure the catalytic activity of molybdenum disulfide, a 2D material that exhibits potential for applications that use electrocatalysis to take out hydrogen from water. Preliminary tests on two variations of the material showed that most production happens at the thin sheets’ edges. The Researchers published their results this month in Advanced Materials. Researchers already were aware that the edges of 2D materials are where the catalytic action occurs, therefore any information that helps maximize it is appreciated, Lou said. The probe-bearing microchips built at Los Alamos and the technique formulated by Lou and lead author Jing Zhang, a Rice postdoctoral researcher, pave a way to rapid screening of promising hydrogen evolution reaction candidates among 2D materials. The majority of the material is on the surface, and you want that to be an active catalyst, rather than just the edge. If the reaction only happens at the edge, you lose the benefit of having all the surface area provided by a 2D geometry. He said Researchers have up to now experimentally established the more conductive 1T prime was catalytic along its total surface area, but the Rice study proved that to not be completely accurate. “Our results showed the 1T prime edge is always more active than the basal plane. That was a new discovery,” he said. After forming the flakes via chemical vapor deposition, Zhang used an electron beam evaporation technique to deposit electrodes to separate flakes. He then integrated a transparent thermoplastic, an insulating layer of poly(methyl methacrylate), and burned a pattern of “windows” in the inert material through e-beam lithography. That allowed the team to probe both the basal planes and edges of the 2D material, or only specific edges, at submicron resolution. The 16 probes on the inch-square chip fabricated at Los Alamos pulse energy into the flakes through the windows. When hydrogen is formed, it escapes as a gas but robs an electron from the material. That generates a current that can be measured via the electrodes. Probes can be addressed separately or all at once, allowing Researchers to obtain data for many sites on a single flake or from numerous flakes. Fast testing will help Researchers modify their microscopic materials more efficiently to make the most of the basal planes’ catalytic activity. Now there’s incentive to utilize the strength of this material — its surface area — as a catalyst. This is going to be a very good screening technique to accelerate the development of 2D materials. Co-authors are Rice Postdoctoral Researchers Jingjie Wu and Hua Gao, Graduate Students Weibing Chen and Jiangtan Yuan, and Pulickel Ajayan, the Benjamin M. and Mary Greenwood Anderson Professor in Engineering and a Professor of Materials Science and Nanoengineering, Chemistry and Chemical and Biomolecular Engineering; and Los Alamos Researchers Ulises Martinez, Gautam Gupta and Aditya Mohite. Lou is a Professor of Materials Science and Nanoengineering. The research was supported by the Air Force Office of Scientific Research and the Welch Foundation.